Wed. #2 is HERE. Please follow us on Tumblr or Twitter, subscribe to us on YouTube or like us on Facebook. Don't miss Thursday Night AMP at 9 PM ET! With the cheap plugs out of the way here's Thursday's latest wrestling news. The YouTube subpocalypse is for real and my YouTube channel could use your support. I need 1,000 subscribers to survive and it's at 707 subscribers right now, an increase from when the bad news broke, but I still need 293 more. While the revenue generated is small compared to a Game Grumps or a NoDQ it's still very much necessary to keep our operation running. Please subscribe to Mistah MegaManFan and help me out! Bad news for UFC 226 - Max Holloway has been pulled from the pay per view given he started to display concussion-like symptoms this week and crashed very badly after the open workouts -- he was "hard to wake up" and had "slurred speech" and was admitted to the hospital immediately. Scary stuff and we hope that Holloway will be okay. In this interview Awesome Kong says she didn't like her ring name at first: "When I first went to Japan, I didn't get to choose my name, Amazing Kong. In fact, I was training in Santa Monica at the New Japan dojo and Shinsuke Nakamura, who's now a WWE superstar, called me Kong. I didn't know if he was just unaware of the connotation that Kong would have for a black person, because he was from Japan, but I got really upset. Then they had to explain to me that they'd recently had a press conference, and that the company that was bringing me over had named me Kong. So I had to go home and really contemplate and really consider what I'd be getting myself into, and whether or not I should just ditch the job, even though it would be a great opportunity for me. I was at home, in Hollywood at the time, and an N.W.A song came on. I remember thinking, 'Hey, N.W.A stands for what it stands for.' Since they can be N.W.A, I could be Kong, and I would make this name my own, and make anyone who sees it, hears it, and relates it to me understand that it's about respect. And that I did. Anyone who sees Amazing or Awesome Kong respects that name first. I feel that that's a goal that my people should always work towards, not a meaning of ridicule or put-down, but always respect. I owned it, and I own it today." 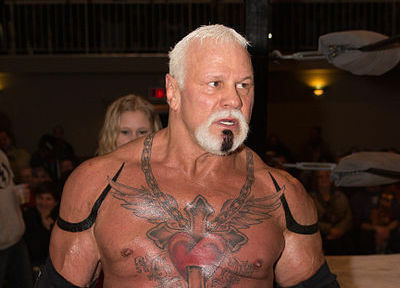 In this interview Scott Steiner talks about becoming Big Poppa Pump: "It was (the) culmination of my career. I first started pro wrestling right after I got out of college at the University of Michigan so I was in that frame of mind where I wanted to wrestle with my brother. After I changed my hairstyle, became a 'bad guy' and became 'Big Poppa Pump' that was kind of the way I thought at the time. There were a lot of politics and bull--t in wrestling. That was the way my mind was. People seemed to like it, and took off with it. My interviews were the way I thought and the way I came across it seemed believable because that was the way I was thinking. The fans got with it and liked it." Last night's WWE NXT highlight videos are available below. Miscellaneous tweets and social media posts are below. Here Matt Hardy talks about tweeting Bray Wyatt before he even returned to WWE: "Long-term booking, my friend. I think Bray is an extremely talented competitor and performer. I'm a big fan of his work. I'm glad I was able to cure him of Sister Abigail and now we're teaming up. I think there's still a much bigger potential with the two of us if we get the opportunity to explore that role, which is something we're working on right now and it'll happen eventually."